At the age of 10, Karsten moved with her family to a farm in Hackleburg. It was there that her love of animal care was first ignited—she developed an intense curiosity about the inner workings and behaviors of the earth’s creatures, and it hasn’t let up since! 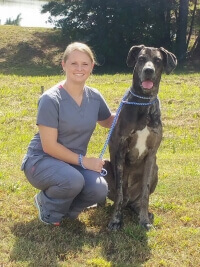 Karsten is proud to now serve the pets and animal owners of the area as a member of the Bell Veterinary Hospital team. During her final year of high school, Karsten interviewed Dr. Bell as a part of a school project, and picked up an application while visiting the clinic. The next year, she was hired on as an employee! Karsten has been a member of the hospital family ever since, and she especially likes helping out with surgical procedures, performing thorough dental cleanings and staying on her toes with fast-paced emergency work. During her free time between work and her collegiate studies, Karsten likes painting, spending time on her family’s farm and enjoying the company of her clumsy and sweet-natured Great Dane, Zeus.